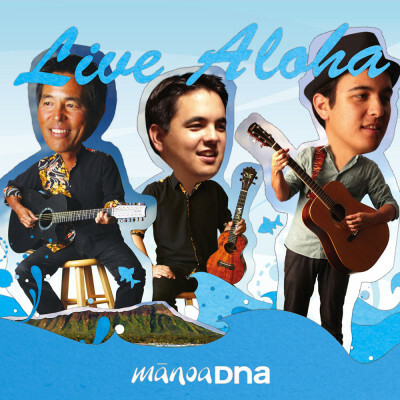 ManoaDNA | ManoaDNA.com | Order Your Copy of Live Aloha! Officially formed in the summer of 2005, MānoaDNA has become Hawaiʻi’s hottest band. MānoaDNA’s energy and intense harmonies create a sound that will sweep you off of your feet. If DNA conjures up visions of sterile science labs for you, then MānoaDNA is about to change your world. Weaving a patchwork of styles and genres into one solid sound, this multi-generational group quickly became a fixture in the music scene. They have taken the science out of DNA and replaced it with harmonies that will touch your soul. “DNA” stands for Dad, Nick and Alex- and yes, it is all in the genes. For five years, MānoaDNA has been captivating audiences across the country and the Pacific. This talented family band brings 3-part harmony, upbeat sounds, and infectious enthusiasm to every stage. Their first three U.S. albums generated seven Na Hoku nominations and won the 2007 Hawaii Music Award for Contemporary Album of the Year. And they continue to inspire rave reviews. Separately they are good, together they are great. “Dad” (Lloyd), a professional musician for over 35 years, quickly recognized the potential for perfect harmony when he saw that his sons had inherited his passion for music. He encouraged and coached them as they strived to take their sound to the next level. Lloyd often draws from personal history and friendships as he showcases the musical talents of MānoaDNA. After graduating from the college, where he was a soloist with the University Singers, Nick returned home and joined forces with younger brother Alex. Their idea, to form a band of brothers and entertain friends and family at casual gatherings and parties, quickly began to gather steam. Their dad added a third dimension and they realized they had a sound worth perusing. Alex, meanwhile, with one year of mainland college under his belt, had returned home determined to pursue his music in Hawai’i. His innate abilities and perseverance have been the catalyst to propel MānoaDNA. Armed with original compositions and a vision, he took destiny by the reigns. He convinced Record Producer Roy Sakuma to record their first album and MānoaDNA has never looked back. As their reputation grows, so does the scope of their popularity.